SEATTLE, WA / ACCESSWIRE / March 15, 2016 / A recent New York Post article titled "The marijuana industry has a dirty little secret" highlighted the growing problem of pesticides and other contaminants after a string of recently recalled products that were found to be contaminated. The problem is partially due to the haste of creating capacity following the legalization in Colorado, although the state government does share some of the blame for failing to implement effective regulations when initially setting up the program. Other states are learning from this mistake and have published pesticide rules, albeit for some after they had already legalized use. Great effort has gone towards the marijuana legalization movement, and the fact that states are willing to admit that improvements are needed shows that people are willing to do what it takes to make the movement succeed in an impartial way just like any other legal, taxed industry. Oregon for example has approved 250 pesticides that can be used safely in unlimited quantities to address a wide range of potential problems while growing. Among them are Nature's Care Garden Disease Control, a fungicide produced by Scotts Miracle-Gro Co. (NYSE:SMG) and Grandevo PTO, an insecticide manufactured by Marrone Bio Innovation (MBII). Nevada, as a second example, requires that an independent laboratory perform a series of tests on usable marijuana, including moisture content, potency, terpenes, foreign matter inspection, microbial screening, mytotoxin screening, heavy metal screening, and pesticide residue analysis. Many states consider Nevada's testing requirements to be the gold standard in the industry and are looking to model their own regulations with the same stringency. This is especially important since the federal government has taken a hands-off approach, as they do have the authority to intervene at any time if the matter was considered a public health issue. The EPA is in charge of the use of pesticides on crops, but as the New York Post article points out, "As of February, no state had submitted a complete application for pesticides to be used to grow marijuana, according to the EPA." Recently, Cannabis Financial Network interviewed Todd Denkin, President and CEO of DigiPath Inc., who operates a marijuana testing lab Las Vegas, to get his thoughts on the industry. The below video provides some great insights into this troublesome trend and what we can expect going forward. "Cultivators want to know what the rules are and want to play by the rules," said Todd Denkin, CEO of DigiPath Inc. to the New York Post, describing the industry's take on the problem. "If you can't grow a clean product, you're going to go out of business." GreenWave Advisors, an independent research and financial analyst firm, believes that the cannabis testing industry could reach $866 million in size by 2020, if federal prohibition on cannabis is lifted. In its report, titled 'Marijuana Lab Testing: An In-Depth Analysis of Investing in One of the Industry's Most Attractive Plays', the firm outlines several reasons why the cannabis testing industry is poised to grow and why it represents a great opportunity for investors. - Cannabis testing labs appear to be highly scalable with opportunity for significant margin expansion, as other high margin businesses, (data analytics and consulting) contribute more to the mix of revenues. Operating leverage should translate to attractive Free Cash Flow yields abetted by recurring revenue streams. - With many players currently jockeying for position and new entrants appearing as each state moves forward with legalization, the lab testing market will become increasingly saturated. Profitability and survival will depend upon technical prowess and adequate capitalization. - The lab businesses that are best positioned to expand market share beyond their initial geographic confines into additional states or regions will provide the most compelling opportunities for investors seeking the prospect of long term growth or other exit strategies such as eventual absorption by established larger cap suitors. The analyst firm projects revenue of $553 million for lab testing alone if the U.S. legalizes cannabis on a federal level. When adding in related services, such as data analytics and consulting, the revenue potential could surpass $866 million. The data troves collected through the testing process could become an increasingly valuable asset and generate substantial revenue for the most accomplished laboratories. This data could be used to determine specific genetic attributes of targeted cannabinoids and assist with maximizing medicinal benefits. DigiPath is a premier play in the burgeoning cannabis testing industry with a Las Vegas-based laboratory that's already generating tangible revenue. Nevada waited 15 years after legalizing medical marijuana to permit sales in dispensaries – which began in July 2016 – as it worked through concerns over pesticides. Currently, the state has some of the strictest testing regulations, with only 22 approved pesticides in low levels. All cannabis must be tested by independent labs before they are approved for sales and the products are destroyed if unapproved pesticides are found on them. By starting in Nevada, DigiPath has built up an operation that follows the industry's best practices to meet the strictest guidelines in the country. Management plans to expand these operations into other states in the future, while bringing along these best practices to help reassure its customers that the testing results are reliable and valid. The company has also worked alongside regulators to help draft testing requirements across the country. With upcoming elections in November, Nevada could also legalize recreational marijuana, which could open the door to a significantly larger market given that Las Vegas is among the country's most popular tourist destinations. Unlike CannaGrow Holdings Inc. (CGRW), which provides consulting services to growers, DigiPath's focus on the cannabis testing industry represents a play on government-mandated revenue that's still tied to the sale of medical and recreational marijuana. 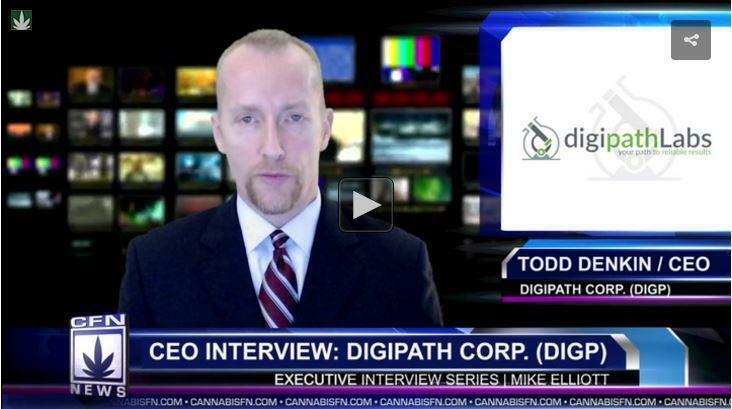 DigiPath is an emerging leader in the cannabis testing industry. According to GreenWave Advisors, this industry could reach over $850 million by 2020, making it an attractive destination for investors interested in the space. The industry's growing problem with pesticides - as highlighted by The New York Post – could mean stricter regulations and that's an area where DigiPath has excelled in the State of Nevada.